Brigham Young, second Prophet and President of The Church of Jesus Christ of Latter-day Saints (which church is often misnamed the “Mormon Church”), ranks among the most influential and important historical figures, not just in Mormon history, but also in American history. Brigham Young was born on June 1, 1801, in Whitingham, Vermont, to John and Abigail Young. His father was a revolutionary war veteran. After marrying Abigail, John Young settled in Massachusetts and then moved to Vermont shortly before Brigham Young was born. The ninth of twelve children, Brigham was born into a life full of work. He later commented that his early life was filled with toil and work, which left him no opportunities for education. While he had only eleven days of formal schooling, his parents taught him to read, and Young maintained a love of reading all his life. His family moved to central New York when he was a boy and, in 1815, his mother, Abigail, who had long suffered from tuberculosis, died. John Young remarried a widow named Hannah Brown some time later. Brigham, however, decided that he needed to work for his own livelihood then and moved out at age 15. He moved to Auburn, New York, where he became an apprentice, and later master, carpenter, painter, and glazier. In 1823, Young moved to Port Byron, New York, where he worked as a painter and carpenter and where, on October 5, 1824, he married Miriam Work. The couple then joined a local Methodist congregation. After four years, Young moved his new family to Oswego, New York, on Lake Ontario. There he joined a group of religious seekers. These seekers were part of a movement in nineteenth-century America of men and women (in study groups) searching the Bible themselves, trying to discover the truth. Later that year, Brigham’s family moved again to Mendon, New York. Miriam gave birth soon after the move and contracted tuberculosis. She became an invalid, and Young was required to take total control of the household, not only working as a carpenter and painter, but also caring for his wife and children. He made a rocking chair for his wife and, every morning, he carried her to it so she could look outside. Later, he would carry her back to bed. During his time in Mendon, Brigham Young worked hard at his trade and, even today, many items built by Brigham Young, including houses, remain in Mendon. In 1830, a young man named Samuel Smith, brother of Joseph Smith, came to Mendon to preach about the newly founded Church, the Church of Christ, or Mormon Church. Smith left a copy of the Book of Mormon with Brigham’s brother, Phineas, who read it, passed it to his father, John Young, who gave it to his daughter, who finally gave it to Brigham. Brigham was intrigued, but cautious. He had grown disillusioned with the denominations of his day and continued to read the Bible on his own. For two years he carefully studied the Book of Mormon and put it to every test he could devise. He studied the Bible as well. Finally, in early 1832, a young Mormon missionary gave a humble testimony of the Book of Mormon in Brigham’s presence. Brigham later said that this humble testimony entered like fire into his bones, and he knew the truth. He and his family, including his brothers, were baptized in spring of 1832. Miriam was baptized, too, but died several months thereafter from tuberculosis. Brigham immediately began preaching the restored Gospel of Jesus Christ in the regions around Mendon. He left his children in the care of Heber C. Kimball, a fellow convert in Mendon, during these missionary excursions. After Miriam ’s death in September 1832, Brigham went to Kirtland, Ohio, to meet Joseph Smith, the Prophet. In that first encounter, he prayed with gathered Mormons in Kirtland and was the first person in the Mormon Church to speak in tongues. Brigham was assigned to go on a mission to Canada early in 1833, and upon his return, he learned that Joseph Smith was asking the Mormons to gather together. Brigham was asked to lead the Mormons living in and around Mendon to Kirtland. He did so, and was reunited with his family. During this gathering, he met Mary Ann Angell, a convert from New York who had joined the Church in Rhode Island. On February 14, 1834, the pair were married in Kirtland. In the summer of 1834, Brigham Young and Joseph Young, one of his brothers, participated in Zion’s Camp, the march to help the driven and oppressed Mormons living in Missouri. Though the expedition was unable to do anything more than comfort them, Brigham later said that this experience was among the greatest learning experiences of his life. 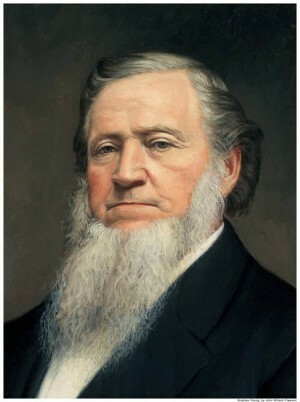 Shortly after the return of Zion’s Camp, Brigham Young was called to be a member of the Quorum of the Twelve Apostles. Over the next few summers, Brigham Young alternated his time between summers going on missions throughout the United States and Canada, and the rest of year where he helped with constructing the Kirtland Temple. As a glazier and carpenter, he was particularly responsible for the windows of the temple. His rise in prominence among the leaders of the Church caused him some problems, when in 1836 and 1837, some in the Church rebelled against Joseph Smith and denounced him as a fallen prophet. Brigham’s loyalty to Joseph Smith caused some to threaten his life, too, and he was forced to flee from Kirtland. When the Church moved to Missouri, Young went too, and helped lead the Mormons to Caldwell County, Missouri, where the Mormons were settling. This new home was very temporary, as conflict erupted between the Mormons and their neighbors who viewed them as a threat, a belief which many Mormons unfortunately stoked by banding together for protection and forming militias. The governor issued the infamous “Extermination Order” in October 1838, and the Mormons were forced out on pain of death. Joseph and other leaders were imprisoned, leaving Brigham Young temporarily in charge. He organized the several thousand Mormons and drafted the “Missouri Covenant” which pledged everyone to assist each other until the last Mormon was safely out. The exodus was made more dangerous and difficult because it was carried out during the bitterly cold winter months. They succeeded, and by early 1839, the Mormons were becoming established in their new home, Nauvoo, Illinois. Joseph was released from prison in April of 1839 and helped select the location of the new city. In 1839, Brigham Young began building his new house in Nauvoo, but soon left on another mission, this time to England. He left, even though many, including himself and members of his family, were extremely sick. This mission of the Quorum of the Twelve Apostles was the first foreign mission of the Mormon Church. Traveling was difficult because of illness, but they at last reached England in April of 1840. Before his return, nearly 8,000 people would be baptized in England while Brigham Young presided. He oversaw the printing of the Book of Mormon in England, as well as hymnals, thousands of tracts, and a newspaper, The Millennial Star. He also established an organization that would help Mormons emigrate to America. Dear and well-beloved brother, Brigham Young, verily thus saith the Lord unto you: My servant Brigham, it is no more required at your hand to leave your family as in times past, for your offering is acceptable to me. I have seen your labor and toil in journeyings for my name. I therefore command you to send my word abroad, and take especial care of your family from this time, henceforth and forever. Amen (Doctrine and Covenants 126:1-3). Except for one small trip in 1844, Brigham Young did not go on long missions as he had done nearly every year since learning about Mormonism, but rather remained with his family and became one of the great leaders of the Mormon Church. In Nauvoo, he oversaw outgoing missionaries and still spent parts of his summers preaching in areas near Nauvoo. He was part of the many important revelations and teachings that came during this period and was tested greatly in his faith. In early 1842, he was one of the first to participate in the Mormon temple ceremony and later he was among the first to be introduced to polygamy, or plural marriage as the Mormons called it. Brigham later recalled that he was horrified when he first learned about polygamy and even wished to die for a time, but later he came to realize that it was a commandment from God. Brigham would ultimately marry many women and father 56 children. Peace did not last long in Nauvoo. While Brigham Young and other leaders left for missions in early 1844, Joseph Smith remained behind. On June 27, 1844, Smith was murdered in Carthage Jail. Brigham Young and the other Apostles could not get back until early August. On August 8, 1844, a meeting was held to decide who should succeed Joseph Smith. Some tried to claim the leadership, but Brigham Young spoke reminding the Mormons that the Quorum of the Twelve Apostles had been charged by Joseph before his death with leading the Mormon Church and held all the keys to the restored priesthood. The assembly agreed and the work went on. The second Mormon temple was completed by December, 1845. Mob violence, however, forced the Mormons to prepare to leave. The first group left in February of 1846, crossing the frozen Mississippi river. Before going, most Mormons took part in the Mormon temple ceremonies. They also signed the “Nauvoo Covenant” which committed the Mormons to assist one another in the planned exodus to the west. Spring was muddy, and the Mormons trudged with difficulty over the soggy Iowa trails, reaching what they called Winter Quarters in Nebraska by fall. Approximately 16,000 Mormons were scattered throughout Iowa and Nebraska. At this time the U.S. army requested 500 men to help fight the Mexican War. The Mormons would receive much needed money in exchange for this loss of men, and it was Brigham Young who had the prophetic foresight to see the potential good. These men, the Mormon Battalion would have their own, fascinating trek west. During the winter they organized into companies and in early April, 1847, Brigham Young and the first 148 Mormon Pioneers began the trek west for Utah. This company arrived in the Salt Lake Valley on July 24, 1847. The small colony began planting crops and preparing homes for the next wave. Young and others returned to help guide the next companies. The December after returning, Brigham Young was sustained as second President of the Mormon Church. By 1850, most of the 16,000 Saints were settled in the Rocky Mountains. The Missouri Compromise created the Utah Territory in 1850, and Brigham Young was appointed as governor by U.S. President Millard Fillmore. The early 1850s were devoted to settling the territory and building homes. In 1853, Mormons began building the Salt Lake Temple. Young established the Perpetual Emigration Fund which provided funds to immigrating Mormons, who then repaid what they could once they were established. The money was then loaned to the next pioneer. The Mormons established colonies for harvesting everything from cotton to ore to fruit. In 1856, Mormon leaders grew concerned about laxity in religious matters among the Mormons and started the Mormon Reformation that stressed re-baptism and hence recommitment to the Gospel, and created the system of Home Teaching pairs of Elders oversee the welfare of assigned families. At the same time, federally appointed judges and officials, who often insulted and harassed the Mormons, were ejected from the state. They returned to Washington to report that the territory was in rebellion against the United States. As no railroad or telegraph existed, the only news came by other travelers or couriers. President Buchanan, believing the reports, cut off all mail supply to Utah, removed Young from the governorship (but did not inform him) and sent an army of 5,000 men to quell the supposed rebellion. The Utah War, as it came to be known, was not much of a war. No battles were fought. In July 1857, Mormons returning from the east reported an army was coming. Brigham Young, fearing that this was another attempt to oust the Mormons as had been done in Missouri and Illinois, refused to leave this time. The Mormons evacuated Salt Lake City and posted militias in the canyons leading to Utah. Determined to avoid bloodshed, the militias were only permitted to harass and delay the army. This they did by burning grass and scattering horses. The tactics worked. The army could not enter until early 1858, by which time cooler heads on both sides prevailed. Brigham Young stepped down as governor, to be replaced by Alfred Cummings, and the army settled west of Salt Lake at Camp Floyd, where they remained until the Civil War. The only tragic incident in the Utah War was the so-called Mountain Meadows massacre in September of 1857. In the midst of the renewed zeal of the Reformation and the heightened tensions caused by the invading army and murder in Arkansas of a favorite son, Mormon settlers and Piute Indians in southern Utah attacked and massacred a traveling company of settlers from Arkansas and Missouri. Letters sent by Brigham Young warning the Mormons to leave these settlers alone came too late (See “Shining New Light on the Mountain Meadows Massacre” for more information about Brigham Young and the massacre). After the massacre, Mormons, fearful that another army would be sent if the incident became widely known, stayed silent for many years. Ultimately, one of the leaders, John D. Lee, was executed for his involvement. Brigham Young did not let the tragic events of 1857 keep him from moving forward with the work of establishing Utah and building up the Mormon Church. In 1861, Brigham Young and the Mormon Church helped establish the transcontinental telegraph. He contracted with the Union Pacific and Central Pacific railroads to have Mormons help finish the transcontinental railroad and later he oversaw the construction of spur lines throughout Utah and Idaho. In the 1860’s the Mormons, under Young’s direction, established cooperatives to help produce sugar, cotton, wool, iron, and so on. They also established cooperative stores to facilitate exchanging the goods. Young loved education. The Mormon Church under his direction established schools for every grade level including three colleges. In 1850, the University of Deseret, later the University of Utah, was established as a co-education school. In 1875 the Brigham Young Academy, later Brigham Young University was established in Provo. In 1877, the Brigham Young College was built in Logan, Utah. It was shut down in 1926 and all students, staff, and equipment were combined with Utah State University. President Young also built Mormon temples. Though he never lived to see the Salt Lake Temple finished, he did oversee the dedication of the St. George Temple in 1877. Other temples in Manti and Logan, both in Utah, were begun. Overall, the 1860s and most of the 1870s were much more peaceful. Colonization and immigration continued. By the time of Brigham Young’s death in 1877, there were more than 115,000 Mormons, 70,000 of whom immigrated to Utah under Young’s leadership. Brigham Young refused to discuss the private details of his family life. He had in his lifetime 26 wives, and 56 children by 16 of those wives. He took good care of his family and was not considered dictatorial or autocratic by them. He even granted a couple of divorces to his wives. Beyond those 26, Brigham young married other women, with whom he did not cohabitate (See Polygamy for a more detailed account of the various types of polygamous marriages). Young married these women to support them and their children financially. Brigham Young and his brothers built several homes in Utah, including the famous Lion House. He also had homes in Logan and St. George where he stayed while visiting the Mormon congregations throughout the territory. In April of 1877, Brigham Young oversaw the dedication of the St. George Temple. He reintroduced the fullness of the Mormon temple ceremonies there. He returned to Salt Lake in poor health. From his office he continued to guide the Church with written statements. That summer he worked to refine the organization of the Church and harmonize its many disparate organizations. On August 29, 1877, the “Lion of the Lord,” so called because of his fearlessness in proclaiming the truth, died at age 76. He was interred on his property in Salt Lake City. Brigham Young is one of the most important figures in Mormon and American history. Under his leadership the Mormon Church grew from 26,000 to over 115,000 members. Nearly 100,000 of those lived in Utah, Idaho, Arizona, Nevada, and Wyoming in one of the over 400 settlements founded under his guidance. He assisted in completing both the transcontinental telegraph and railroad and established a railroad system throughout Utah, Idaho, and Wyoming. He directed the immigration of 70,000 people to the Rocky Mountains, and even parts of Colorado and California. By trade he was a carpenter, painter, and glazier, and practiced these crafts all his life, building many of his own homes and most of his furniture, which exhibit his high degree of craftsmanship. He oversaw large-scale irrigation projects that rendered farmable large tracts of Idaho, Arizona, and Utah. He established cooperatives that produced everything from cotton to iron, and directed the creation of the first incorporated department store in the world, ZCMI. An organizational genius with a gift for leadership, he served two terms as governor of Utah, and spent nearly 30 years as President of the Mormon Church. His proudest accomplishment, no doubt, was his family, about which he was reluctant to speak, considering it a personal matter between himself, his family, and his God. Polygamy is often associated with him and he is the most famous polygamist in Mormon history, even though his predecessor, Joseph Smith, introduced the doctrine. Young, while he defended the doctrine as divine, would not discuss the private details of his life with others, but his 56 children considered him a devoted, caring father. He was also an advocate for women’s right to vote (Utah gave women the right to vote in 1870), and to obtain education. He ensured that the women of his own family had opportunities to go to college. While he himself had only eleven days of formal schooling, he read widely and established three co-educational colleges before his death. He advocated freedom to practice one’s religion, peaceful relations with one’s neighbors, and the importance of serving others. He also cared deeply about nature and would not stand by and see it be abused by thoughtless men. Brigham Young is often considered controversial by those who misunderstand him. He has had many nicknames, “American Moses,” “Lion of the Lord,” and even “the most married man in America.” To Mormons, he is one of the greatest prophets ever to have lived. While remembered most often for his practical deeds, he was also a great teacher and delivered hundreds of orations in his life on everything from the best way to reprimand children, to the nature of God. Among Mormons he is considered one of the greatest Prophets of the Most High.